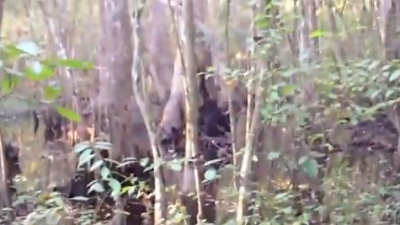 Is this a real Skunk Ape? Or just another hoax? "Here is exactly what I seen, I'm not sure what it is but can someone please tell me? Is there a person who can do video analyses or something? I got scared and ran away, i wish i stayed to keep taking the movie. I was out hunting hogs, just sitting in a part of the swamp i have heard em before...it is not too far from a road. I was wearing hunting camo and just sitting dead still waiting for it to get dark, cause thats when the hogs come out. I hear a noise behind the tree i was sitting on, i thought it was the hogs, when i got around i could not believe my own two eyes. There was this huge black thing crouched by a dead cypress about 50 yards away, i thought it was a hog but saw these big shoulders and a head upright with hands. It looked like it was digging out the stump. My first instinct was to run, i did not even think of shooting...then i know no one will believe me...it was like everything slowed down...i was scared! I took out my iphone and started videotaping it..i guess i pushed the record button twice cause it stopped blinking red.. but i pushed it again. I hear a truck driving down the road and the thing stood up!! I was trying to be dead quiet...when it stood up i could not control myself and ran. That stump was huge and i'd guess the sucker was 7feet tall, i am a hunter and am pretty darn good at guessing size. I always heard stories of skunk ape and honey island swamp monster from these parts but never thought about it being real ever. has anyone seen anything like this in mississippi?"